Bible teachers might have opportunity to share the Gospel and lead unsaved students into a saving faith in Jesus Christ. Some adult church-goers may have grown up in a Christian home and acquired a lifestyle consistent with being a Christian yet never entered into a personal relationship with Jesus. Some might consider themselves Christians simply because they aren't atheists. 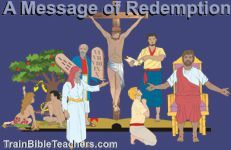 Teachers of adult classes shouldn't assume all students are true believers in Jesus Christ. This 5 page teacher training worksheet provides seven suggestions, written as do's and don'ts, to implement if you want to reach those who might not truly know the Lord.